ITW Mazel specialise in the manufacture of Radishield, an advanced technological product developed for the protection of employees within the nuclear, defence and non-destructive testing (NDT) industries. 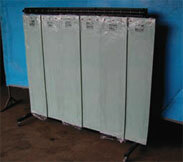 The Radishield Radiation Protection System is a patented totally encapsulated shielding system. It’s unique formulation gives flexible shielding in inaccessible and restricted applications where traditional methods of shielding are difficult to provide. Available in flat sheets, moulded shapes and profiles together with Guide Tube Shields and bespoke fabrications, Radishield provides the necessary protection for any situation. 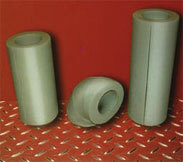 General purpose shielding where ultimate properties of Silicone Radishield are not required. Available in flat sheet form only. Standard or special sizes / profiles / thicknesses available. High temperature resistance (-50 to 200°C – 250°C int) and Flame Retardant. Low chlorine, fluorine, sulphur content (suitable for contact with stainless steel). Easily cut and shaped by hand. 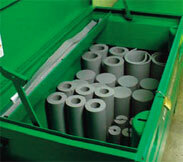 Material will not sag or slump like traditional alternative products for example pvc bags and woven lead. Available in flat sheet form – standard or non-standard sizes / thicknesses. Available in bespoke CAD designed easily fitted moulded shapes, e.g. pipewraps, t-pieces and valve covers. Can be incorporated into customised containment units. Fire Tested to NFP 92-502 Standard Class M2 (WarringtonFire Global Safety). Calibrated by National Radiological Protection Board (NRPB) & University of Leeds. Approved for use nationwide in EDF & GDF plants (EDF Toxicology Division of Occupational Medicine). Rolls Royce tested (NSRP Compatible). Developed as an alternative to standard Radishield products where customers require a LEAD FREE alternative. Same shielding and flexibility as standard Radishield. Available to order in flat sheets and moulded shapes. Tested by National Radiological Protection Board. Fire Tested to NFP 92-502 Standard Class M2 (Warrington Fire Global Safety). The Mazel Radishield Guide Tube Shield is a patented shielding system for use in the NDT (Non-Destructive Testing) industries to reduce transient doses. This allows the reduction of safe working distances together with the associated health & safety and downtime/cost benefits. Designed for use with industry standard source guide tubes, Radishield Guide Tube Shields are individually manufactured to customers’ required length. Reduces instantaneous and transient dose rate. 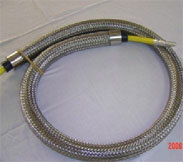 Stainless Steel braided for on-site durability. Custom made to required length. Fits over standard source guide tube.